The X-Rite RM200QC Imaging Spectrocolorimeter simplifies color measurement from incoming material to outgoing product shipments in a portable unit that fits comfortably in your hand. The RM200QC Imaging Spectrocolorimeter is designed to provide stable color comparisons for materials and products wherever color control is important. It is an elegant, portable instrument that fits comfortably in your hand or pocket to take with you wherever you go – from the quality control lab to the manufacturing floor to supplier inspections in the field. Simply upload Pantone, Munsell or any other standards, set tolerances, and quickly see pass/fail indicators when measurements are taken. Using this affordable instrument will boost your color quality when color requirements are too stringent to depend on visual evaluation alone. It is more accurate and reliable than basic colorimeters and removes the uncertainty that can result when using color swatches as the final color comparison. This is due to the fact that everyone sees color differently, color perception is dependent on lighting conditions, and physical swatches can be damaged or deteriorate over time. The RM200QC was specifically designed with color scientists, quality control professionals and production managers in mind. Achieve stable color quality throughout the entire quality control and manufacturing process, including field testing with third-party suppliers. Manage suppliers efficiently, ensuring that each adheres to a single standard. Control variations between lab formulation, production, and final goods. Control batch-to-batch variations during the manufacturing process, reducing waste and rework. Eliminate issues related to staff experience; everyone uses the same device with an easy pass/fail indication based on approved standards. This easy-to-use color measurement instrument delivers high reliability and accuracy, often eliminating the need for larger, more unwieldy instruments, especially for field applications and on the manufacturing floor. It is an exceptional tool that delivers accurate color data that takes the emotion out of color evaluation and helps gain faster customer approvals. 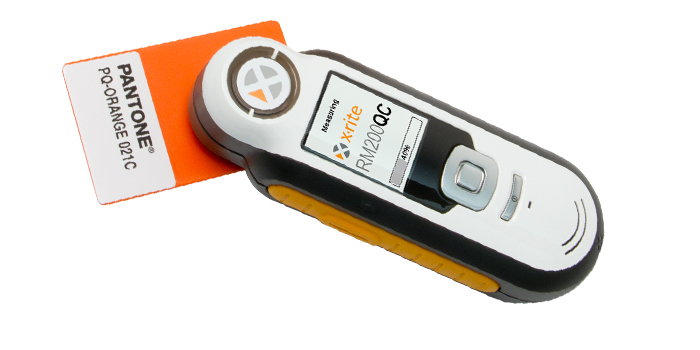 With the RM200QC always in your pocket or purse, you’ll always be ready to accurately evaluate color – anytime, anywhere.